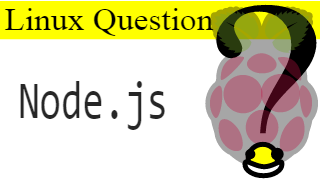 Home » shell » Quick Linux Question: How do I install the latest Node.js? Quick Linux Question: How do I install the latest Node.js? How do I install the latest Node.js in Rasbian? "wget" downloads the newest version of Node.js to the current directory. When the file is done downloading then you can use the next command to install it. You need to have administrator privileges in order to install software globally in Linux, which is why we use "sudo". Then we install the Node.js software package we just downloaded. This could take almost a minute if your using a Raspberry Pi Zero, or Raspberry Pi A/B. To verify that Node.js installed properly you can use "node -v" to check Node.js's version. You can also use "npm -v" to display the current version of npm.